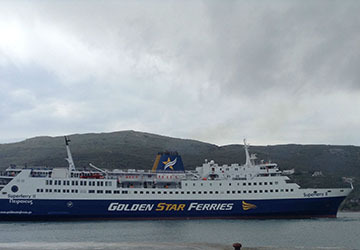 Golden Star Ferries operates seasonal ferry services in Greece, connecting the mainland with the Cyclades Islands in the Aegean Sea, an archipelago which includes the popular holiday destinations Mykonos and Santorini. 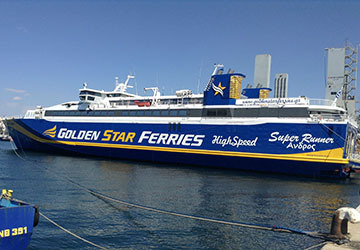 Boasting one of the most contemporary fleets in the Aegean, with operations beginning in 2011, the Golden Star Ferries ships are well suited to the modern day traveller, focussing on speed, safety and reliability. The extensive timetable offers fast and regular routes between the port of Rafina and the archaeologically rich Cyclades Islands, operated by stylish vessels with high-tech amenities. Acquired in 2016, F/B Superferry has undergone a complete renovation, leading the way in standards of maritime travel within in the Cyclades. The smaller and faster craft, named Super Runner, was purchased in 2017 and incorporates the most amount of islands into its current timetable, serving Tinos, Mykonos, Paros, Naxos, Ios and Santorini. 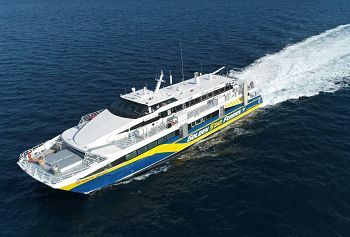 F/B Superferry II is the company’s original ship, with a capacity for over sixteen hundred passengers, a home cinema room, luxurious lounges and plenty of open deck space. 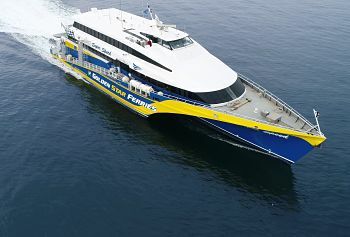 Direct Ferries provides a ferry timetable and price comparison, based on your search criteria, allowing you to compare Golden Star Ferries products with multiple ferry company timetables and fares in one search. 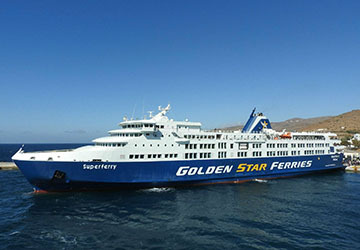 Compare Golden Star Ferries timetables and prices now with all alternative ferry operators before booking your ferry ticket to ensure you get the best option for your ferry trip. It was really realxing trip. We departed on time, and arrived on time. There is a lot of shade on the upper decks, so it was not hot even though it was early afternoon trip. "Morning trip of the 10th of August"